Available here in our office is a non-invasive, pain free and effective treatment option. 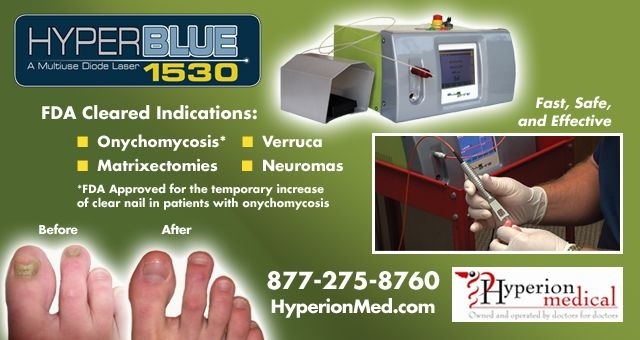 Dr. Eisenberg has been using the HyperBlue Laser for treatment of toenail fungus for five consecutive years. We have seen a high success rate with the Laser treatment over time, call our office for more information! Also referred to as onychomycosis, fungal nails are infections underneath the surface of the nail, which may also penetrate the nail. Symptoms may include discoloration, brittleness, loosening, thickening, or crumbling of the nail. For more information on Toenail Fungus Treatment, call David H. Eisenberg, DPM, FACFAS in Carrollton, TX at 972-418-0788!